In an interview with Entertainment Weekly, bestselling author Stephen King has publicly acknowledged Rocky Wood for his input on “Doctor Sleep”, the soon-to-be-released sequel to The Shining! Rocky has authored numerous non-fiction books on Stephen’s career and has even unearthed several previously lost stories. Is it distracting to have to think about little details like that when writing a book? Rocky Wood’s official website launched! As well as information on Witch Hunts, you can learn about Rocky’s award-winning Stephen King books, profiling some of the best-selling authors obscure and lost works and also his first graphic novel, Horrors! Great Tales of Fear and their Creators, illustrated by Glenn Chadbourne and also published by McFarland. Rocky’s site was designed by Rick Pickman. 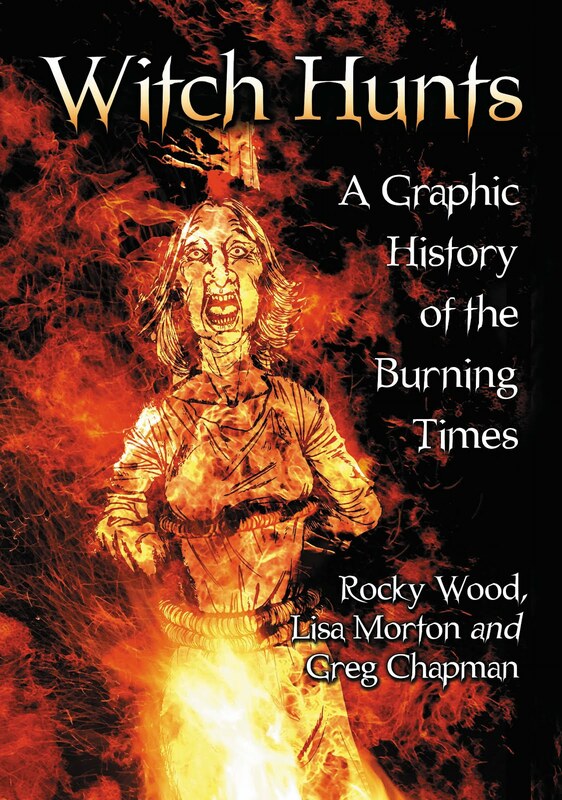 Witch Hunts: A Graphic History of the Burning Times is now available for the Kindle! Amazon US and Amazon UK recently added the title to its Kindle listings*. The book would be the perfect gift for the Kindle fanatic or history buff. *Please note: due to the size of the Kindle file, the download will take longer than usual. 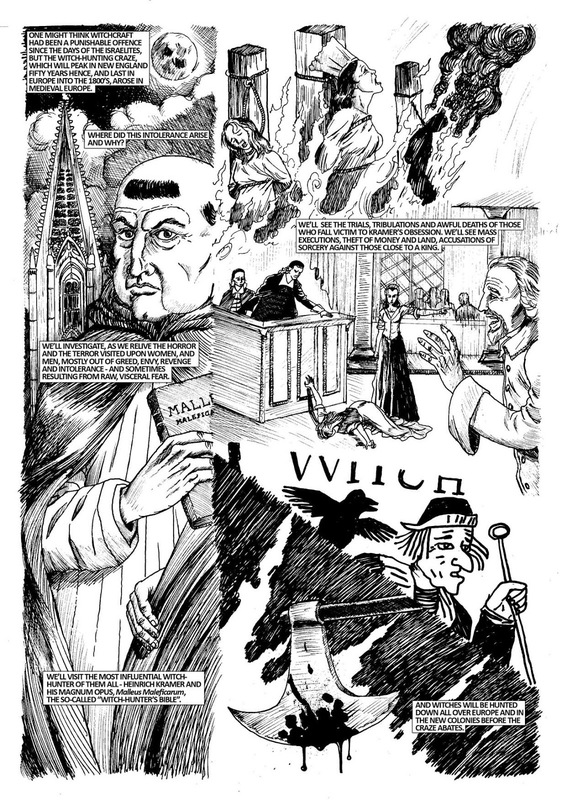 Over the course of about 14 months from October 2010 to November 2011 I illustrated roughly 200 pages for the graphic novel Witch Hunts: A Graphic History of the Burning Times, authored by Bram Stoker Award Winners Rocky Wood and Lisa Morton. The graphic novel was published by McFarland and so far has received much critical acclaim of which I am most humbled. It was a lot of work, particularly given the fact that I had to draw the entire book in the evenings and on weekends due to my full time job. It was an amazing challenge taking Rocky and Lisa’s scripts and interpreting their words and descriptions onto the page. About 99% of my illustrations made the grade but there were some pages and drawings which didn’t suit and were left out or altered. These pages are from the original proposal to McFarland. The page 2 you see here is nothing like the one that was ultimately published. It was the problem page, but it was also in my opinion the most important page in the book. 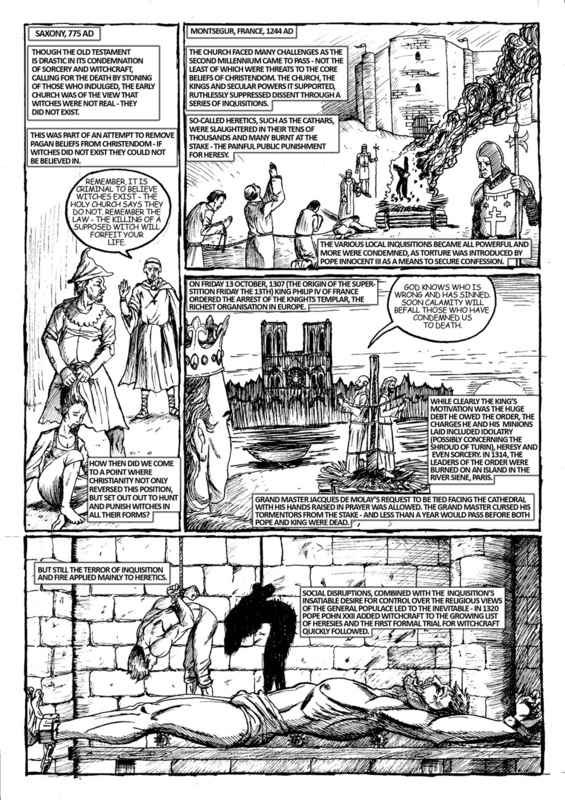 It was a page intended to summarise what the graphic novel was about. The problem arose because there was a lot of text and I was trying to be creative and it just didn’t work. This page was a still being adjusted right up until the deadline. The other issue is that I was initially responsible for the placement of text – thankfully McFarland took this over. Not that I wasn’t capable, but I really needed to concentrate on the art rather than adding the text on the computer. 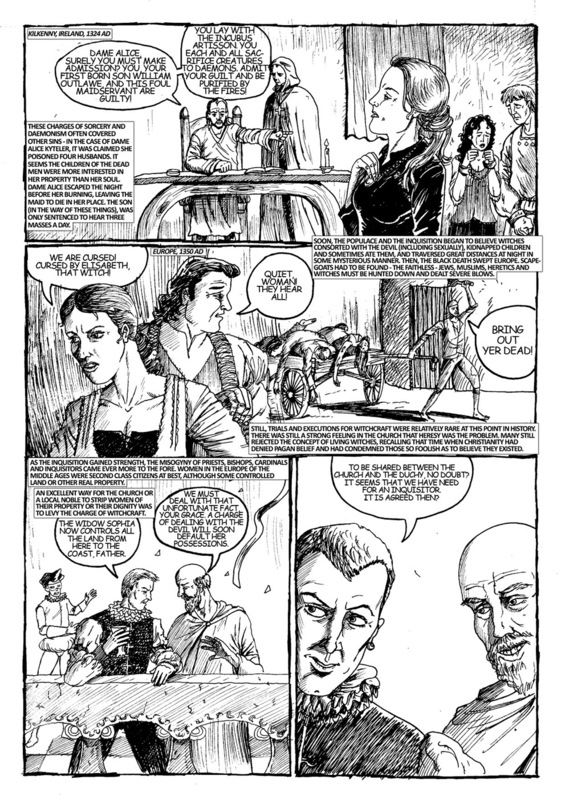 The interesting thing about pages 3, 4 and 5 is that a lot of the panels you see here were ultimately redrawn as larger versions. I was thinking too small and the opening chapter of the book had to be expanded to seven pages. Obviously McFarland liked the pitch, but we had to go back to the drawing board and think big. 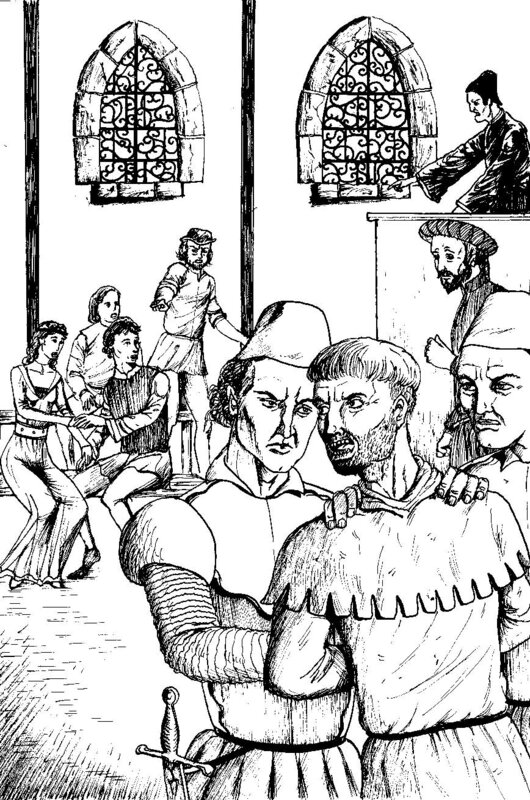 We decided that it would be easier to have more full page illustrations to cater for the text. I felt the text was just as crucial in the telling of this book – just as much as my illustrations. Yes, some editing was done but I think there were still some 20,000 words in the book. This page, page 5, one of my favourite pages from the book, was changed a little at McFarland’s suggestion. Vines were added to separate the Adam and Eve from the peeping monk panel, but I also wanted to tie the two ‘realms’ together and ended up drawing the maidservant holding Adam’s hand. All in all the five page proposal was a very exciting challenge that dictated how the rest of the graphic novel would look. I wanted to capture that medieval engraving/etching look and I’m glad I ended up going with this style. 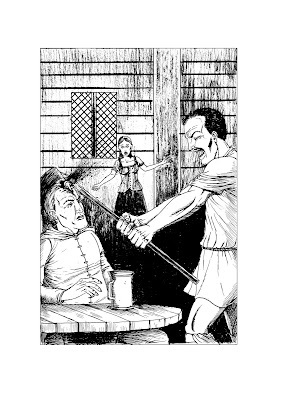 This is a page from chapter six where de la Case kills Master Jehan for accusing his daughters of witchcraft. 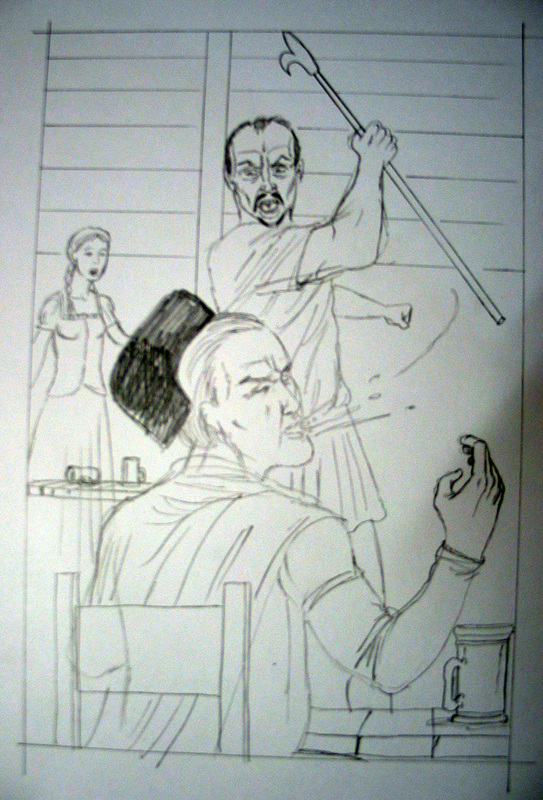 The issue with this page was that I wasn’t depicting the “blow” de la Case delivered properly. It took a few roughs before I got it right. 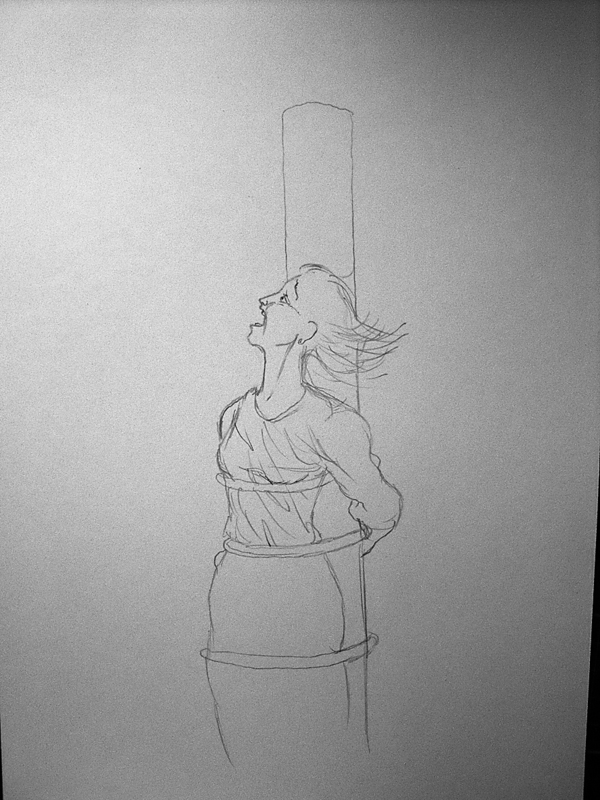 The third rough captured it as it was intended. Other pages that were changed…. The page above here was changed because while you could see the man being tortured with the claw-like device, you couldn’t see who was doing it so I had to redraw it. The meeting between the man and the two witches also didn’t look sinister enough. The final page (right) actually turned out much better as I was able to merge the two different scenes into one so the reader’s eye could travel smoothly from top to bottom. This page had to be completely redrawn as well because the intended focus was all wrong. 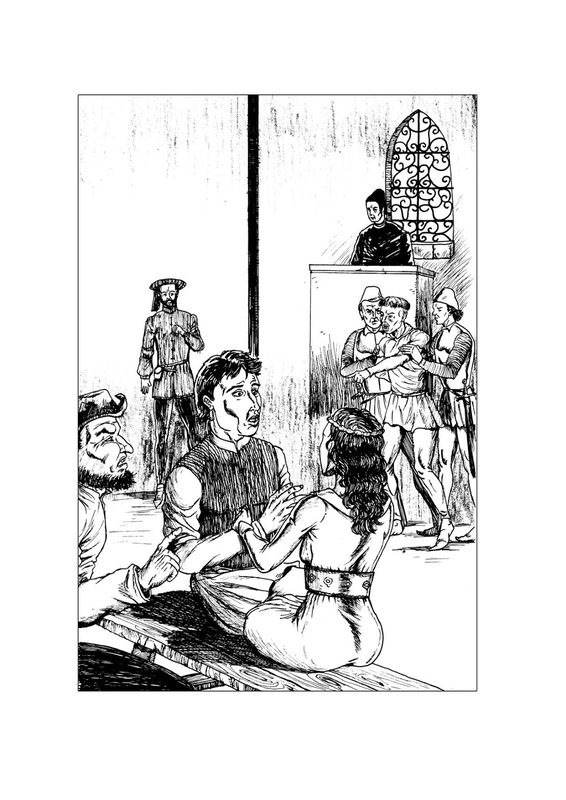 In the first version I made the criminal prominent when it should have been the man and his wife in the foreground. This was simply a case of me misinterpreting the script. It was a bit of a shame having to redraw it because I particularly liked how the soldiers clothes turned out. We all liked this image but over time we realised that the drawing of the woman was being lost in the flame (no pun intended there, I promise) so it was back to drawing board. The overall image was liked, but it was agreed that the woman wasn’t “witchy” enough and I was asked to make her much older. 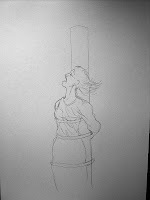 By this stage I had already inked the final image! But all it took was a little white gouache and the final cover was done! We hope you enjoy reading it as much we all enjoyed creating it! Witch Hunts’ co-author Lisa Morton spreads the word about Halloween! Lisa Morton’s latest book Trick or Treat: A History of Halloween is garnering considerable media attention and awards in the lead-up to Halloween. Lisa was interviewed by Mark Frauenfelder for boingboing.net’s Gweek segment, where she talked about the origins of Halloween and even dispelled a few myths about the meaning of the holiday. Trick or Treat: A History of Halloween is Lisa’s second non-fiction Halloween book and it certainly has further cemented her reputation as the “Queen of Halloween”. The book is currently #1 in Amazon’s Holiday category. Lisa was recently named the winner of the General Non-Fiction book category at the 2012 Halloween Book Festival in Hollywood, California. Witch Hunts isn’t the only book Rocky Wood, Lisa Morton and Greg Chapman have doing the rounds. Rocky is known around the world as one of the top experts on best-selling author Stephen King, and his latest work, Stephen King: Uncollected, Unpublished was revised and updated. Published by The Overlook Connection Press, the book includes updates on fiction and screenplays by King and King himself actually had input into the edition. Lisa Morton has also expanded her library of works with a new fiction and non-fiction title, being released, just in time for Halloween. Trick of Treat: A History of Halloween was just published by Reaktion Books, further cementing her reputation as the “Queen of Halloween. In Trick or Treat, Halloween aficionado Lisa Morton provides a thorough history of this spooky day. She begins by looking at how holidays like the Celtic Samhain, a Gaelic harvest festival, have blended with the British Guy Fawkes Day and the Catholic All Souls’ Day to produce the modern Halloween, and she explains how the holiday was reborn in America, where costumes and trick-or-treat rituals have become new customs. Morton takes into account the influence of related but independent holidays, especially the Mexican Day of the Dead, as well as the explosion in popularity of haunted attractions and the impact of such events as 9/11 and the economic recession on the celebration today. Jack Lichtner is the genius behind Hell Manor, America’s most successful Halloween haunted house. Mazes, scare zones, live actors, special effects, crazy gore…Hell Manor’s got it all. But Jack gets in over his head when he hires Maeve, a mysterious woman with a penchant for bloody magic and murderous kin who want her back. This Halloween, Jack must use all his powers of illusion to fight off the real magic of the ancient tricksters who have invaded Hell Manor. 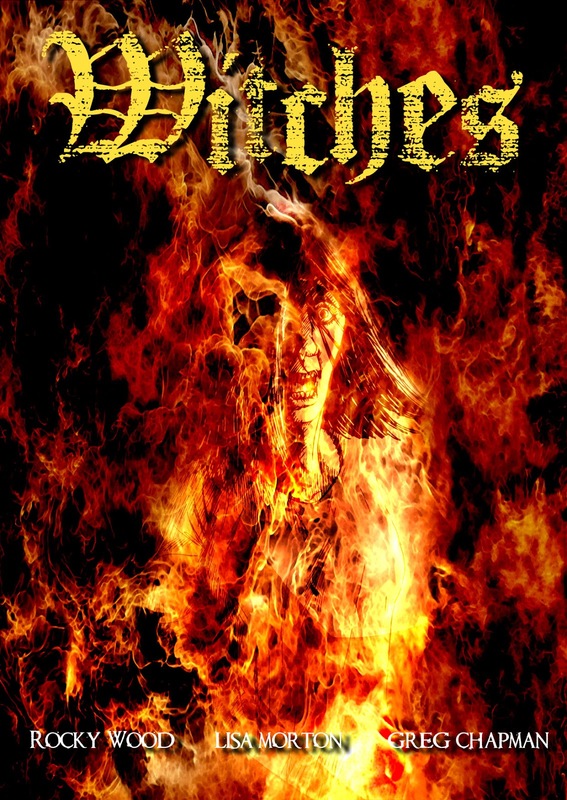 And finally Greg Chapman latest novella, Vaudeville is also available in e-book format from Dark Prints Press. 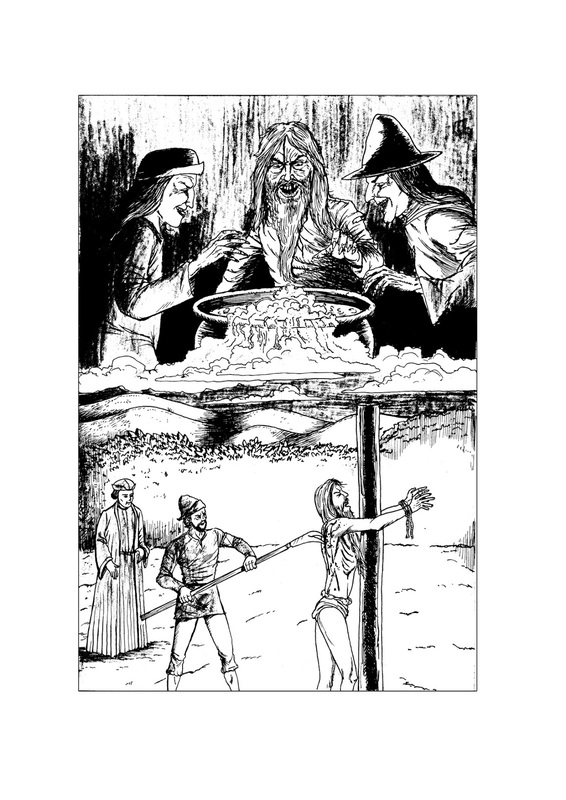 So, if you enjoyed Witch Hunts, then you’re going to love these latest works from Rocky, Lisa and Greg. The perfect Halloween gifts! Witch Hunts authors get into the Halloween spirit! Lisa Morton, a highly regarded expert on Halloween, dispelled some myths on Halloween in her post and offered writers some tips on using Halloween myths and history in their fiction. Lisa also has some new releases pending – her new Halloween book “Trick or Treat: A History of Halloween” and a new Halloween-themed horror novella “Hell Manor”. Rocky Wood, has talked about his writing career, particularly his “never-ending” research on Stephen King and of course his forays into writing for graphic novels. 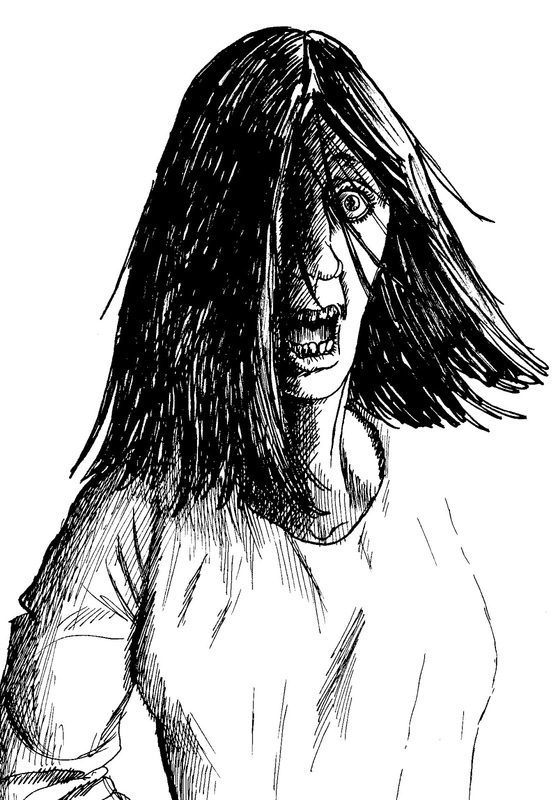 Witch Hunts artist Greg Chapman has also written a post for Halloween Haunts and it will feature in the coming weeks. 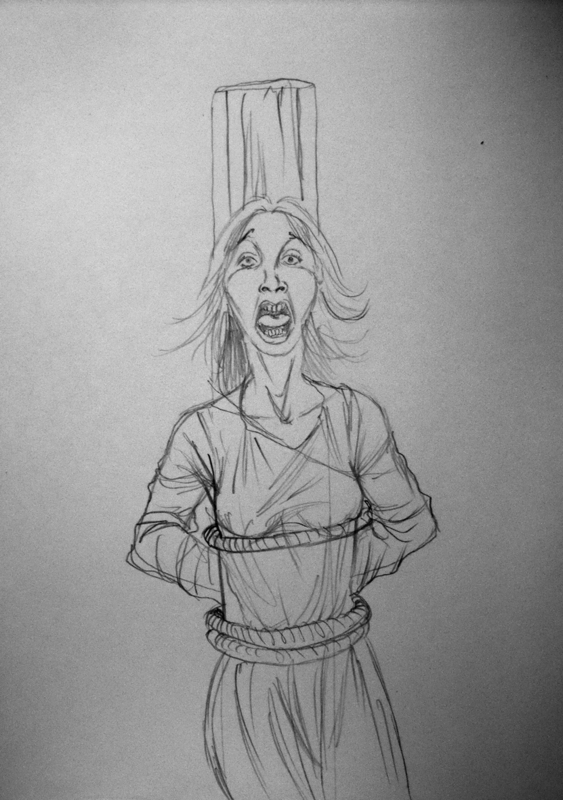 Greg also created the advertising artwork for Halloween Haunts and the HWA’s new blog banner.